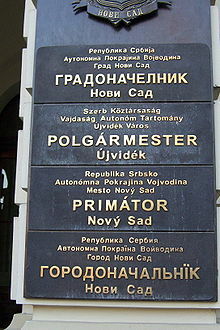 Multi-lingual sign outside the mayor's office in Novi Sad, written in the four official languages of the city: Serbian, Hungarian, Slovak, and Pannonian Rusyn. Immigration to Canada over the past 100 years has shaped Canada, with each new wave of immigrants adding to the nation’s ethnic and cultural composition. Half a century ago, most immigrants came from Europe. Now most newcomers are from Asia. As a result, the number of visible minorities in Canada is growing. And, Canadians listed more than 200 ethnic groups in answering the 2001 Census question on ethnic ancestry, reflecting a varied, rich cultural mosaic as the nation started the new millennium. In the 2016 Census there was more than 250 ethnic groups in Canada. New Canadians, representing many lands and widely separated sections of Old Europe, have contributed to the Prairie Provinces a variety in the way of Church Architecture. Cupolas and domes distinctly Eastern, almost Turkish, startle one above the tops of Manitoba maples or the bush of the river banks. These architectural figures of the landscape, apart altogether of their religious significance, are centers where, crossing the threshold on Sundays, one has the opportunity of hearing Swedish music, or the rich, deep chanting of the Russian responses; and of viewing at close hand the artistry that goes to make up the interior appointments of these churches transplanted from the East to the West…It is indeed a mosaic of vast dimensions and great breadth, essayed of the Prairie. Another early use of the term mosaic to refer to Canadian society was by John Murray Gibbon, in his 1938 book Canadian Mosaic. Gibbon clearly disapproved of the American melting-pot concept. He saw the melting pot as a process by which immigrants and their descendants were encouraged to cut off ties with their countries and cultures of origin so as to assimilate into the American way of life. In 1965, John Porter published his influential sociological study, Vertical Mosaic: An Analysis of Social Class and Power in Canada. Porter's book showed that some groups (e.g., those of British origin) were better off with respect to measures of income, education and health than others. For example, groups of eastern and southern European origin tended to fare less well by these measures. The worst off were the First Nations and Inuit. Porter saw this vertical arrangement as being related to power and influence in decision-making. Thus those of British origin tended to be overrepresented among the elites in government, economic and political spheres. Porter’s findings have been tested in several studies since 1965 and have been modified slightly. For example, the economic disparity between ethnic groups has narrowed somewhat and Francophones are better represented in politics and government. However, the socio-economic elites in Canada remain dominated by people of British origin. Since the beginning of the 20th century, Canada has been one of the world's major immigrant-receiving societies. Until the 1960s immigrants were expected to assimilate into the mainstream society. Arriving as it did at during a time of social upheaval, Porter's work had a marked influence on Canadian social policy. The view of Canada as a mosaic of cultures became the basis for the Trudeau government's multiculturalism policies in the early 1970s. The Canadian government established the Official Multiculturalism Act in 1971 and appointed a minister responsible for multiculturalism in 1972. In 1973 a Canadian Multiculturalism Council was established, along with a Multiculturalism Branch within the Department of the Secretary of State. The "cultural mosaic" theory is not without critics. Some pundits, such as The Globe and Mail's Jeffrey Simpson, and Carleton University journalism professor, Andrew Cohen have argued that the entire melting pot/mosaic dynamic is largely an imagined concept, and that there remains little measurable evidence that American or Canadian immigrants as collective groups can be proven to be more or less "assimilated" or "multicultural" than each other. ^ Douglas, Allan (2004). Understanding military culture: a Canadian perspective. McGill-Queen's University Press. pp. 111–115. ISBN 0-7735-2664-1. Retrieved 2011-01-16. ^ Kalman, Bobbie (2010). Canada: The Culture. Crabtree Pub. p. 4. ISBN 978-0-7787-9284-0. Retrieved 2011-01-16. ^ Burgess, Ann Carroll; Burgess, Tom (2005). Guide to Western Canada (7th ed.). Globe Pequot Press. p. 31. ISBN 0-7627-2987-2. Retrieved 2011-01-16. ^ Levine, Randy and Gifty Serbeh-Dunn (Spring 1999). "Mosaic vs. Melting Pot Voices, Volume 1, Number 4. Retrieved on: June 13, 2008. ^ Statistics Canada. Canada’s ethnocultural portrait: The changing mosaic. ^ Day, Richard J.F. (2000). Multiculturalism and the History of Canadian Diversity. Toronto: University of Toronto Press, 149-150. ^ a b c Valee, F. Vertical Mosaic. The Canadian Encyclopedia. Historica Dominion. Retrieved on: 2011-09-22. ^ Gardner, D. (September 24, 2008). "We're often more like Americans than we're like other Canadians." Canwest.com Ottawa Citizen. Retrieved on: 2009-11-20. Gibbon, J. 1938. The Canadian Mosaic, McClelland & Stewart Limited, Toronto. Porter, J. 1965. The Vertical Mosaic: An Analysis of Social Class and Power in Canada. University of Toronto Press. This page was last edited on 26 March 2019, at 21:57 (UTC).